Now THIS is venerable street art! I am taking an educated guess that the person behind this campaign is trying to be “edgy”. 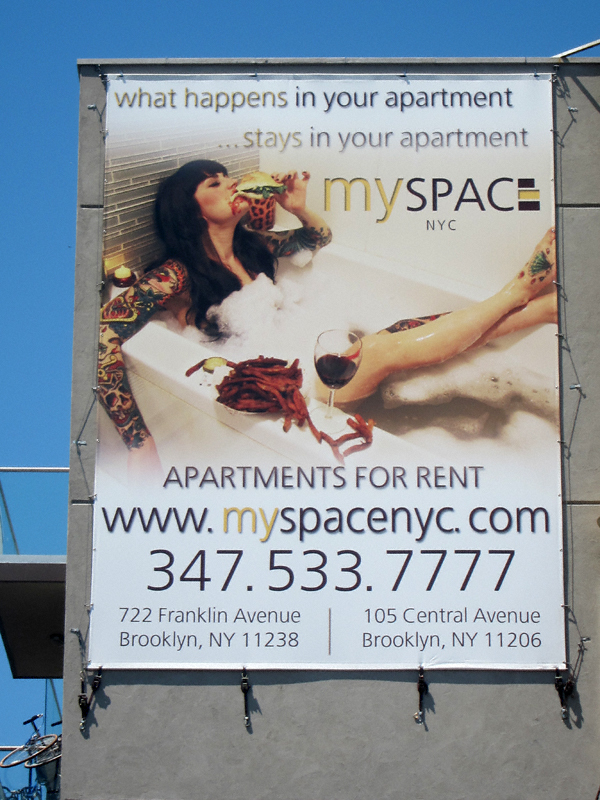 This is completely undermined by the fact that north Brooklyn has a number of people who are very much like the woman depicted in this ad. In fact, I’d say this “type” has become quite common. Throw in, say, a few double-jointed people plying their “talent”, a few of our chronic public inebriates and perhaps a trained circus chimp for good measure and I will give this message some consideration. As is I am not terribly impressed. SCRATCH THE PREVIOUS: If this person truly wanted to “shock” people he/she should feature a family of four (race is not terribly important as long as it is apparent said family lives on the median income hereabouts which methinks is around $36,000/year) totally bereft of tattoos NOT and acting in an entitled/anti-social manner. It’s been my observation the previous are a dying breed hereabouts. You’re not upset that her fake tattoos would never survive a bubble bath? Because I am. Won’t someone PLEASE think of the tattoos, people! Must be that my eyes are bad, but I can’t even make out what is supposed to be going on in that photo. It reminds me of a particularly fitful nightmare I had once after I passed out one late night with an episode of “Sea Hunt” on the TV. psssht.. get with the program, everyone cool is on facebooknyc.com now. I can afford zee rent or zee tattoos. Not bose. Also did informal survey in fauxhemian hotspot. No one admitted to paying for their tats. Everyone “knows an artist”. Either tat artist must be very broke or the “artist” in reference is a parent whose “art” involves granting unfettered credit card access to their credit cards to their bedizzened crotchfruit. Btw, I remember when that fam. of four you described lived around the corner from me. They were pretty nice, although both were a little red eyed from working nightshifts, she as a nurse, he as a vending machine supervisor. That chick in the bathtub is prolly eating their long dried intestines as tapas.